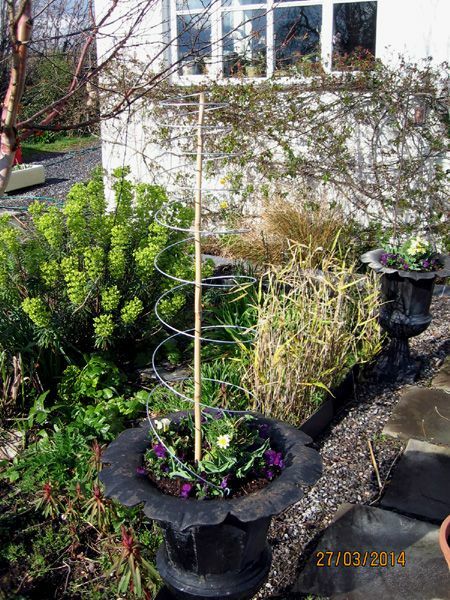 Box of 3 galvanised steel wire extending vertical spiral plant supports. Easy to use - simply insert spiral into bamboo cane stretch out the spiral, which extends out to to as much as 2 metres,and fix the other end to ground with supplied peg. At the end of the season remove spiral from cane, the spiral will collapse back on itself, and flat pack away for easy storage. Ideal for supporting a wide variety of climbing plants including clematis, jasmine, sweet peas and so on. Also brings some oft needed height to displays in pots. In storage the plant support has a diameter of approx 30cm.